This morning we were treated to a most unusual sight. A clear patch of sky behind us let the sunrise illuminate a shield of approaching rain drops to create a most unusual rainbow. At about 7:47 AM we first noticed a band of color streaming up from the western horizon. I grabbed my camera, ran outdoors and got off one shot. As I stood there composing a second frame the bow began fading and rapidly disappeared. Clouds, moving in with the rain, snuffed out a brilliantly golden sunrise. The rest of the day was dark, breezy, and damp. A good day to spend in the office where I was stuck, actually. Better would have been at home, sipping a warm drink and listening to quiet music. Tonight we hear the wind howling around the house, sometimes screaming as it pushes on the windows. 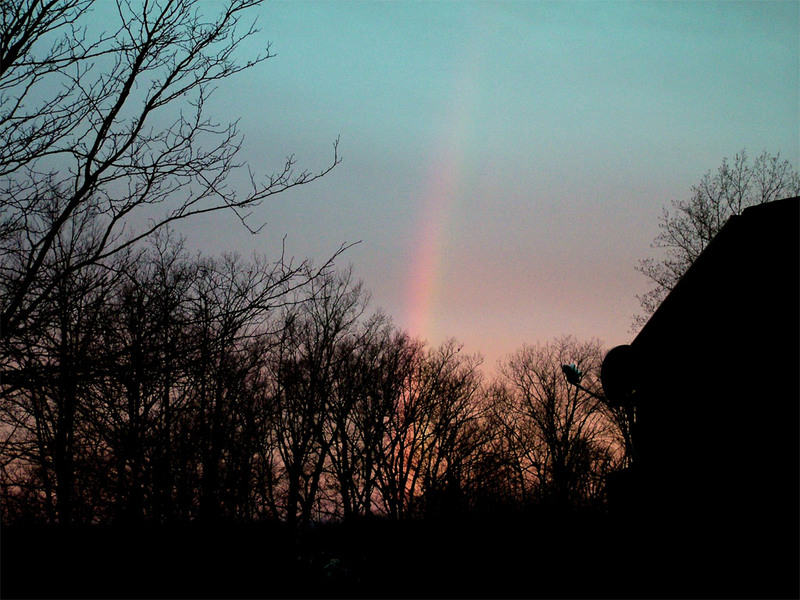 It should be a good night for sleep –if the rising winds are not too noisy– but we'll remember the fleeting December rainbow that started this drab day.